Newport Jazz Festival Celebrates 50 Years An annual mecca for jazz enthusiasts, the festival has featured legends like Duke Ellington and Billie Holiday. Hear Dan Morgenstern, Director of the Institute of Jazz Studies at Rutgers University. 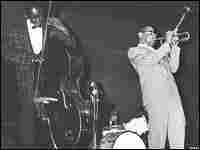 On a mid-July weekend in 1954, the "First American Jazz Festival" debuted in Newport, Rhode Island. A motley collection of musicians and fans gathered for the inaugural show, which featured performances by Ella Fitzgerald, Dizzy Gillespie, Billie Holiday and Gerry Mulligan, among others. The jazz festival was born. As it marks its 50th anniversary, the Newport Festival is among the events for jazz enthusiasts across the world. From Louis Armstrong to Diana Krall, Count Basie to Cassandra Wilson, virtually every jazz star has participated at one time or another, and many unknown talents have used the festival as a springboard to discovery. Founded by nightclub owner and musician George Wein, the festival has spanned the entire spectrum of jazz with big band, modern, gospel, Dixieland and even fusion, a controversial addition for jazz purists. This year's festival is a tribute to straight-ahead jazz and features a long lineup of greats, including Dave Brubeck, Ornette Coleman, Harry Connick, Jr., Wynton Marsalis, Wayne Shorter and Cedar Walton. NPR's Michele Norris talks with Dan Morgenstern, director of the Institute of Jazz Studies at Rutgers University about the historic anniversary.